Filmmakers are always looking for “tips and tricks” to help them make better movies. 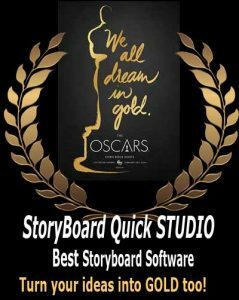 While storyboarding often finds it’s way under something that would be “nice to have” with today’s easy to use technology, like StoryBoard Quick, the one time luxury pre-production step has gone from something you can to – to something you must do if you want to make your movie the best it can be. Whether you are at the helm of a multi-million dollar production or the director and cameraman of your own indie short, planning to do a run-and-gun or gorilla style shoot, storyboards are the essential visual reference to make sure that you never forget a shot. Storyboards are also essential for early feedback and digital storyboarding encourages quick, painless editing, leading to significant savings in time and resources. The fact is, while there are some amazing storyboard artists out there who can draw just about anything, you don’t need to be an artist yourself to come up with a great-looking, comprehensive list of shots. In fact, storyboards really just need to make sense to you and those you are working with in order to help everyone understand what is needed for the next shot. Check out this short video from RODE Reel where they make the case for implementing storyboards on every kind of shoot. Applications like StoryBoard Artist and StoryBoard Quick help you quickly and effectively convey the cinematic shots you see in your head and get everyone on the same page.